We always mix up Bisquick Sausage Balls for the holidays. We take some to dinners and gatherings but also make up a batch or two for home. The recipe is really easy for sausage balls — only three ingredients, but it can be a little confusing the first time making them. Once you get it all figured out, you can mix these up easily. First measure the Bisquick into a large bowl. If you're using pre-shredded cheese, pour that in with the Bisquick and stir. Shredded cheese is not as moist, so it stirs in easily and pretty evenly. I don't think it tastes as good though. If you buy block cheddar, then grate around 10 oz. Since block cheese is moister, grate a little and fluff that to cover the cheese with Bisquick. Repeat. Repeat. 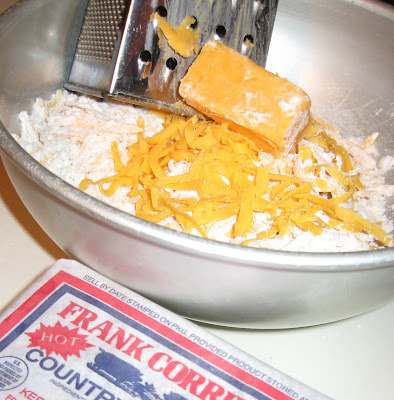 This keeps the grated cheese from ending up as a big clump in the middle of the mixture. Once the Bisquick and cheese are mixed together, it's time to add the sausage. Use a good grade of sausage for tastier sausage/cheese balls. The cheaper meat is fattier and the sausage balls are greasy. I'm using a local brand here that I love. It's Frank Corriher sausage. To find something similar in your area, look for sausage wrapped in paper or buy bulk breakfast sausage in the fresh meat section. I much prefer hot sausage, but it's fine to use mild. I just like hot foods in general. To mix in the sausage, you really need to use your hands. This is not much fun. It's pretty gross to squash flour, cheese and sausage, but that's how to get it mixed up well. It takes a while to get the sausage mixture nice and smooth. This is a great job to put off on the kids if possible. I did not get so lucky. The boys were off and gone when I made this batch. I also forgot to take off my ring. That's a mess. Remember to take off rings before making sausage balls. When the mixture is done, it should be one big smooth ball. Once the mixture is ready, cover a cookie sheet with sides (so grease does not roll off into your oven) or a baking dish with tin foil. Sausage balls can be baked right on the pan, but that's pretty messy. I prefer to cover my pans with aluminum foil. Roll the mixture into small balls about the size of little ping pong or golf balls or walnuts and place them on the pan with a little room. They expand and spread out a bit when cooking. Not much though. You don't have to have a lot of space between sausage balls. 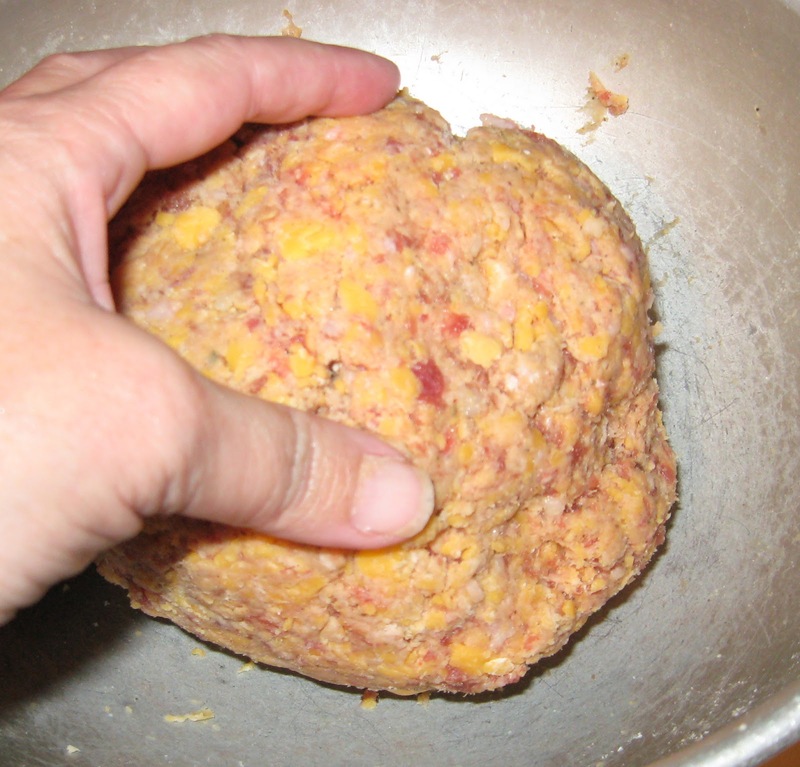 This recipe makes more sausage balls than might be expected. I use two small cookie sheets to make a batch of sausage balls. Bake the sausage balls at 350 degrees F for 20 minutes. The sausage balls should be lightly browned. Some spots will be a little darker than other spots. Remove the pans from the oven and let them sit and cool. This is a good time to sample the sausage balls, because they are wonderful hot. My mouth is watering just thinking about it. 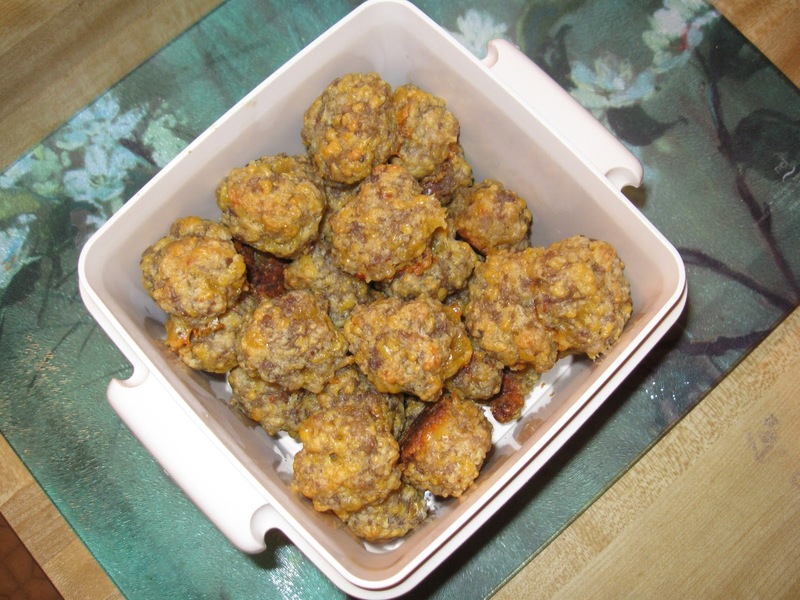 Once the sausage balls are cool, put them in airtight containers and store them in the refrigerator. Since they have meat in them, they need to be kept cold. 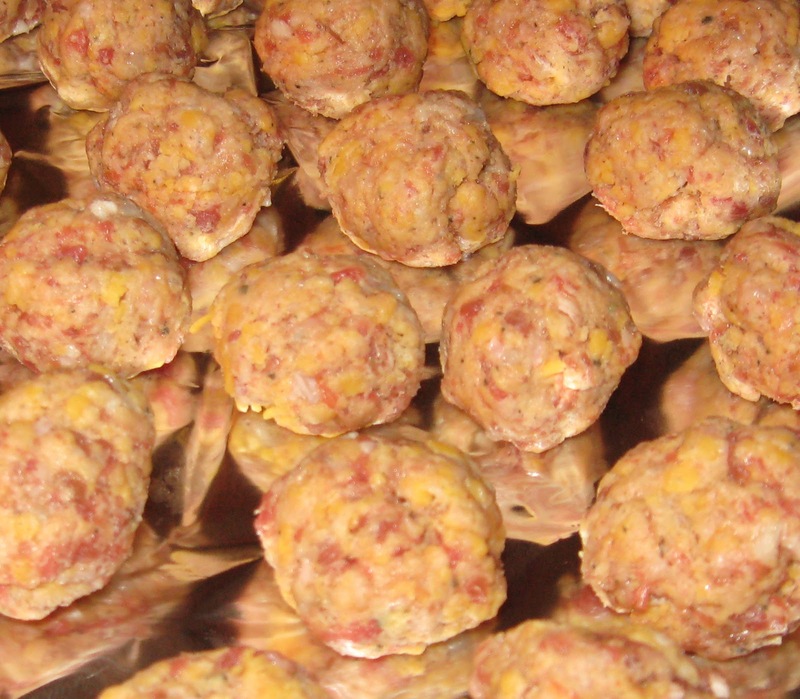 Sausage balls can be served cold and are good, but we prefer to heat them up. Sausage balls can be heated in the oven or in the microwave. If I have time, I like to heat them in the oven right before serving. The sausage balls are a little crispier on the outside when oven heated wrapped in tin foil versus when zapped in the microwave.